Mad Hatter Creations: Hand Painted Murals is an established design company serving customers throughout Middlesbrough, Darlington, North Yorkshire and County Durham areas. We can ensure that any space looks good all the time and save you the hassle: leaving you to simply sit back and enjoy your home. We provide a full range of painting services at excellent rates. 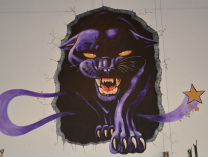 Our painting services include hand painted murals, portrait painting, wall art, canvases, sketching, commissioned canvases. Mad Hatter Creations: Hand Painted Murals offers you a team of qualified and highly experienced painters based in Middlesbrough, covering all the Middlesbrough, Darlington, North Yorkshire and County Durham area. In fact our team of experienced painters are willing to travel anywhere. Character canvases can be anything or anyone you want - if you have a specific design or picture you want us to use let us know! Portrait painting can be a tricky task and without the right tools and equipment also very difficult. Don't waste your hard-earned weekends struggling with the wrong tools for the job, or the wrong employees of the job...employ Mad Hatter Creations: Hand Painted Murals to do it for you. We have many years experience of portrait painting and hand painted murals in Middlesbrough and the North Yorkshire area. Celebrity canvases seem to be the latest fashion! Canvases of your favourite shows, celebrities or films, perfect for gifts and loved ones! Majority of Canvases are done using acrylic paint and the choice of style is up to you! Alternatively liked mentioned above you can opt for the Hand Paited Murals - however please remember that if it is something that you would want to keep then a canvas would probably work better! 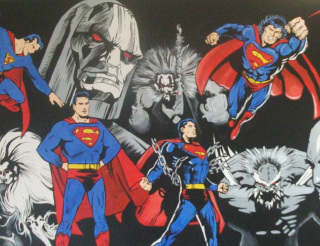 Wall Murals do give the WOW factor, but they are very difficult to take with you if you move!!!! Are you struggling to find the feature for your wall or paint the perfect mural? Hand painted murals are no easy task: so why not employ a qualified painter / graphic designer to make a truly professional job of your Murals and Wall features. 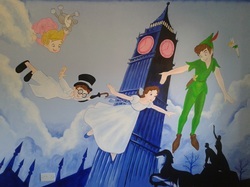 Mad Hatter Creations: Hand Painted Murals covers almost all types of painting and design services. Here's a list of the painting and design services we offer: Hand painted murals, Wall murals, Hand painted portraits, Pencil Sketches, Canvas painting, Character Art, Wall Art, Portraits, Feature walls, Nurseries, Restaurants, Offices. So for all types of paintings call Mad Hatter Creations: Hand Painted Murals : North Yorkshire's friendly, experienced and highly qualified artistic company.